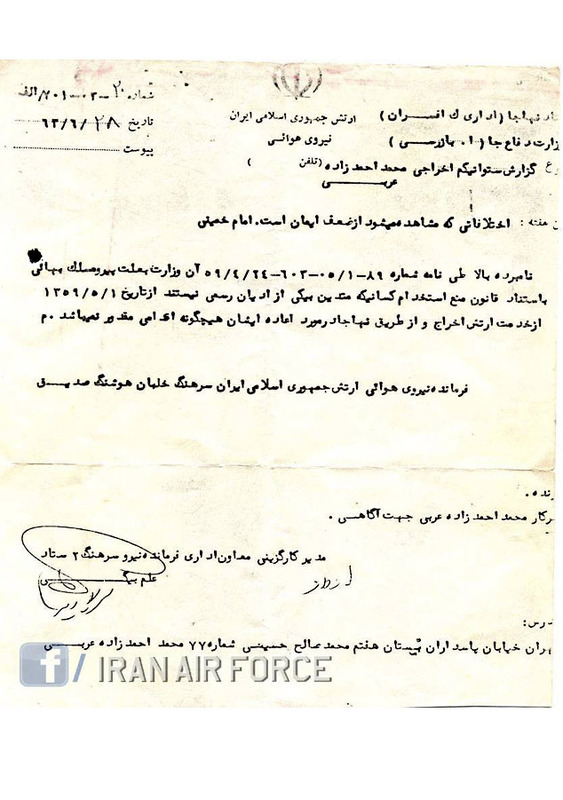 This document indicates that first lieutenant, Mohammad Ahmadzadeh Araabi, was dismissed, because of his adherence to the Bahá’í Faith, from his service in the Armed Forces (the Air Force), based on the law prohibiting employment of those who are not believers in one of the official religions of the country. According to paragraph twelve of the Iranian Constitution, Shi‘a Islam is the official religion of Iran, while according to paragraph thirteen the only recognized religious minorities in Iran are Zoroastrians, Jews, and Christians. Commander of the Air Force of the Islamic Republic of Iran, colonel pilot, Houshang Sedigue. Recipient: Officer Mohamad Ahmadzadeh Arabi- for your information. Mohamad Ahmadzadeh Arabi, Pasdaran Street. 7th Bostan. Mohamad Saleh Hosseini number 77.